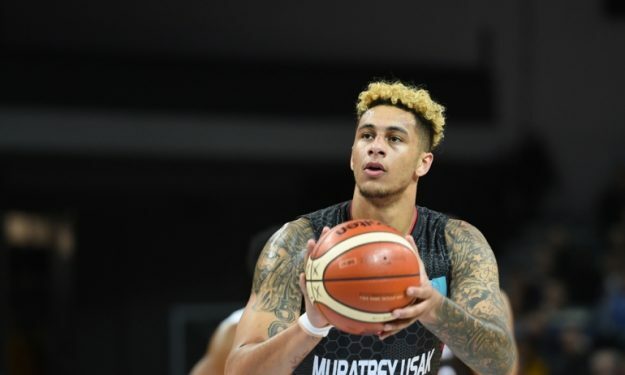 ransition from USA to European basketball wasn’t initially smooth for Zach Auguste but it didn’t take him long to reveal on court the powerful game he brought with him. Transition from USA to European basketball wasn’t initially smooth for Zach Auguste but it didn’t take him long to reveal on court some of the powerful game he brought with him. While a rookie in Europe and pro player for the first time in his life, Auguste managed to post a career-high 31 points (plus 14 rebounds) last week in a victory of Usak Sportif over Rosa Radom, earning MVP honors for Round 11 of the FIBA Champions League. Perhaps it’s not a surprising that a major European club is already interested in him, as he reveals to Eurohoops. The Greek-American power forward also talks about the inheritance that his days in Notre Dame left him, his NBA ambitions, why he picked Turkey and Usak Sportif as the first destination of his professional career and… his desire to play for the Greek national team. Did your years in Notre Dame provide you with the best possible “school” when it comes to getting prepared for pro basketball? The L.A. Lakers signed you on August but then waived you near the end of preseason. Does this give you an extra motivation to get in NBA in the near future? Why did you choose coming to Europe after being cut by the Lakers? Did you receive any other offers besides the one by Usak Sportif? There must be other reasons behind choosing Usak, right? Your mother is of Greek heritage. Are you in the process of getting a Greek passport? Perhaps to play in the Greek national team? Team rosters and salaries in the NBA were recently increased. Do you think that this will help you get back to the NBA?